AN all-new parish council, to represent residents in the Chadwick End area, is being mooted as part of a boundary review. A SITE left to go to wrack and ruin in the heart of Balsall Common is to be redeveloped. A NEW era for Balsall Parish Council has been promised as Coun Ian Hedley takes over as chairman. 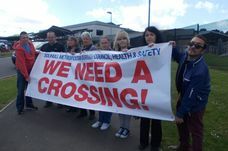 WORRIED walkers are lobbying for a safe route on a stretch of road between Arbour Tree Lane and the Black Boy Inn, Knowle. The letter published last week from Mr Eames regarding Balsall Parish Council contains a number of errors which need clarifying. A long-running dispute over the management of Chadwick End Village Hall was set to be voted upon at a poll last night (Thursday). THE Knights of nearby Temple Balsall may have settled their disputes with a gentlemanly sword fight but parish councillors in Balsall Common are instead battling each other in a war of words. ‘Mr Guest’ quotes from the minutes of Balsall Parish Council which state that £200 would be paid to help the Bugle to set up a new team to run the Bugle (Letters). SOLIHULL Council is championing growing your own vegetables with the opening of two new allotment sites.